Mulch: What is it, Why do it? This is the time of year when I tell my clients and friends that they should be topping up the mulch in their garden. One particular friend, when I told her this, said “I can’t bear the look (and smell!) of bark chips” and this got me thinking that perhaps I should enlighten you as to why you should mulch and what’s the best thing to use. The main purpose of mulching is to suppress weeds and retain as much moisture in the soil as possible. All soil types have their challenges, free-draining soils might be easy to dig, but because the water can drain away quickly, it takes with it the valuable nutrients that the plants need for nourishment. At the other end of the scale we have heavy clay soil which is very fertile, but becomes impossible to dig when very wet and so compacted in dry hot weather that it’s impossible to put a fork in it, let alone dig it! I firmly believe that the best material to use for mulching is something that will put nutrients back into the soil. This is especially important for sandy or chalky soils but for clay soils, where nutrients are not really an issue, any organic matter will really improve the structure of the soil over time. You could use a screened weed-free compost or spent mushroom compost which also contains well rotted manure. If you want to use bark chip then choose a composted bark (rather than decorative bark) as this will break down and condition the soil (and it doesn’t smell horrible either!). 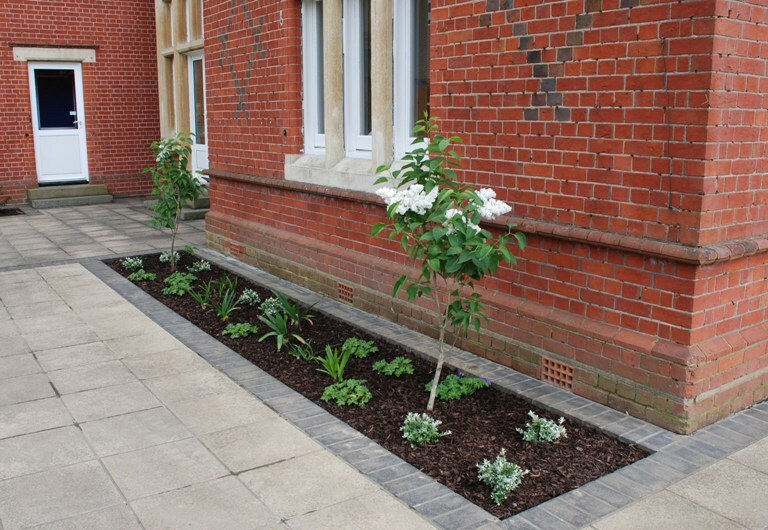 The picture above shows mulched bark which was applied to the flowerbeds when they had been newly planted. totally agree about mulching, – of course home made compost is my weapon of choice!. Spent mushroom compost is great, but very alkaline, so not soo good to use year after year if your garden is already neutral or chalky soil.